As I’ve mentioned previously in this column, it takes a very specific kind of iOS game to grab my interest. I’m not a huge fan of first person shooters or clunky free-to-play titles; multi-touch puzzle games and the occasional 2D RPG are my bread and butter. 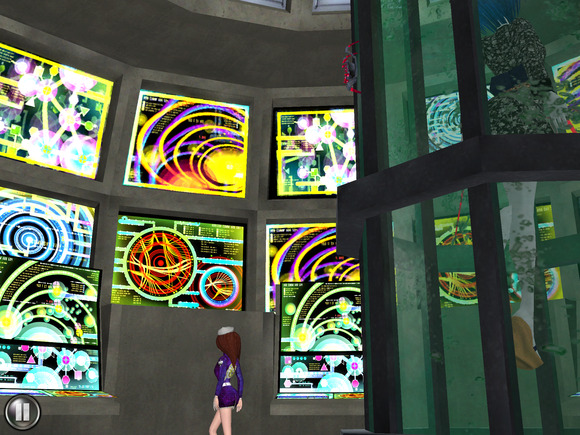 It was luck and a random connection that led me to try Giant Spacekat’s Revolution 60, a 3D hybrid that’s part RPG, part chess game, and—surprisingly—part compelling animation film. And I am so very glad I did. I had the privilege of being on a podcast with Giant Spacekat co-founder Brianna Wu a few months ago, and it was there that I first heard about the company’s game—an ambitious sprawl built upon the stories of female assassins, tech wizards, androids, and spies. Wu’s passion for both her company and their upcoming title convinced me to give Revolution 60 a spin when it arrived Thursday, and I was in no way disappointed. Revolution 60 is classic science-fiction with an interactive iOS twist. Giant Spacekat’s game captures everything I love about action/adventure films, classic sci-fi, and good storytelling—and puts it on display through a smart series of choices, reactions, events, and combat sequences. The game’s starting screen drops you in the middle of a mission gone wrong, cleverly working in hints and tutorials while you fight your way to freedom. I was hooked from the second minute of gameplay: The story and dialogue grab hold of your imagination and don’t let go, while the cinematics keep you enthralled as everything unfolds. I’ll be honest—I went into the game with some hesitation over the game’s visuals; despite being built in the age of iOS 7’s flat, muted color scheme, Rev 60 embraces tactile controls and brightly-colored backgrounds, reminding me more of the early games of my youth than the more-modern style we see from major releases today. Rev 60's chess-style combat system is excellent, but strays far from the typical iOS 7 look. And that's okay. But you know what? It works—and what’s more, it works well. No, the screenshots may not look as artsy as Sword and Sworcery, but the visuals are just as stylized and polished. Instead of pixel art, Wu and her team have built the game on a neon palette of nostalgia, with environments that are cinematically as vibrant as any multi-million dollar title you can pick up. Giant Spacekat’s four-person team does this by focusing on the stuff that matters—smooth animation, perfectly-placed camera angles, and well-defined characters. By the game’s end, you’ve long stopped caring that it’s lacking the multilayer shading you might find in a top-tier platformer. As I mentioned above, Revolution 60’s gameplay mixes a variety of different controls to make for a truly engaging experience: At any point, you may be asked to choose a conversation response, explore an area, fight a baddie on a giant grid, or think fast with multi-touch gestures. While Rev 60 offers a number of different paths depending on your success with various characters, the world isn’t as open to exploration as a console title, instead guiding you through the game with numerous cutscenes. But those scenes almost always require your involvement in some way, be it asking a question or tracing a circle. It’s up to you to move the story along and put the pieces together. Mid-scene, you're asked to do various multi-touch tasks to progress the story forward. Occasionally, those mechanics can feel a bit tedious—there are a few moments of tap-to-walk-down-a-hallway that seemingly take forever—but by and large everything fits seamlessly. Having finished the game once, I’m excited to replay it and take a different path; maybe toy more with the rogue side of Revolution 60’s protagonist. This is a game for people who love good stories; who may not be ready for a big-tier title like Mass Effect but want the same character investment; and for those who genuinely enjoy fantastic iOS games. The first hour of Revolution 60 is free, so you have no excuse not to go give it a spin; if you like it, pony up $6 for the full version. Revolution 60 combines great storytelling and excellent iOS interactivity to create an immersive, innovative, and well-stylized game.